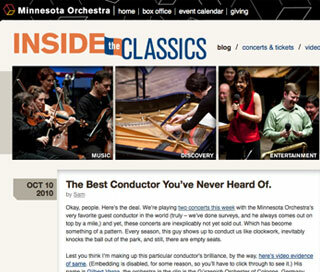 My first few months at the Minnesota Orchestra were spent building three different microsites. None of these sites exist anymore; we moved away from the microsite concept over the next two years. 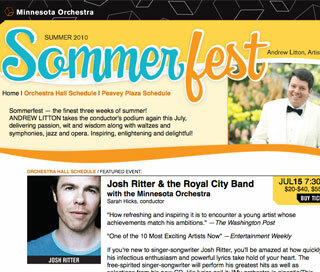 Two of the three were built in ColdFusion, which powered the Orchestra’s old website. Process: starting with statistics from former blog/microsite, decided best way to organize content and re-wrote promotional copy to fit new goals. 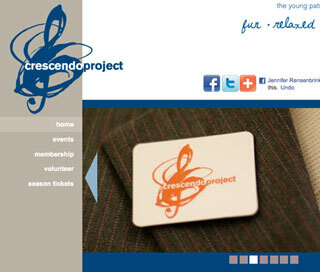 Provided multiple design mockups, coded new WordPress theme and installed it on an external server. Process: working with print designer, developed updated brand identity and completely revamped online marketing strategy, adding social media and expanding event promotion opportunities.